Of course I meant turkey bacon, but the real trick to making this burger a hit is making sure you invest the the time to season your meat well. My favorite way to cook this is out on the barbecue grill so it gets that flame grilled taste. Serve with sweet potato fries for a little extra added beta carotene. So lets get started shall we? Before you do anything, go turn on your grill if you have one. Spraying the the rack with cooking spray made for grilling, before lighting. In a mixing bowl combine the meat with the grated onion and garlic. Crack the egg into the mix and add the milk and Worcestershire sauce. Season with the salt, pepper, and garlic powder. Mix well. Divide the meat and begin forming your patties. Put your patties on the grill and allow to cook untouched for about 4 minutes. Whatever you do, do not press down on the patties. That will dry out the burger. Flip them over only once and allow them to cook to the desired doneness. Top with a slice of cheese. 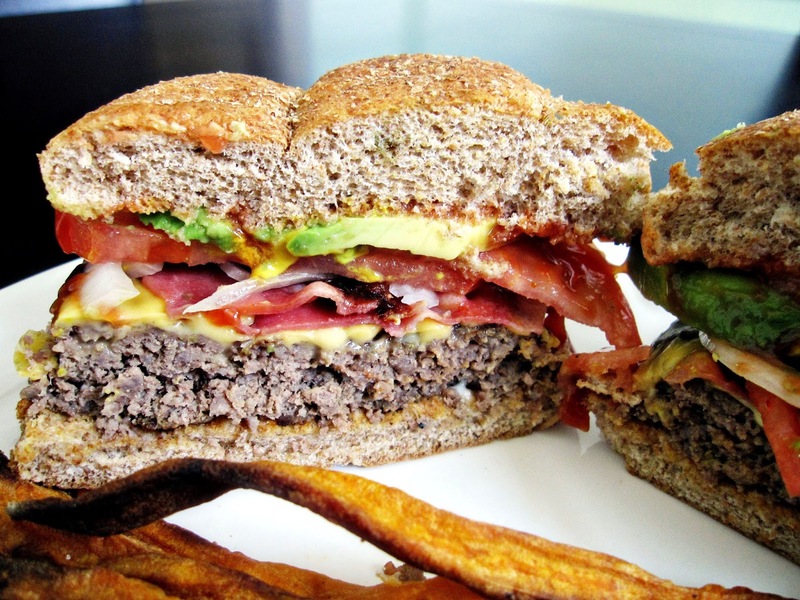 Remove the patties from the grill and begin assembling your burger. Place the patty on the bottom piece of the bun and top with the bacon. Top with the onion, tomato, avocado and any other condiments you like. For me I like to add pickles, ketchup and mustard. Line a cookie sheet with foil and spray with cooking spray. Assemble the fries on the sheet and drizzle the canola oil evenly over the them. Bake at 400 degrees flipping midway. Remove once the fries are crisp. Mi sándwich favorito, después del cubano, of course, es el de Turkey with bacon and avocado. Me llevo tu receta para el Bacon Avocado Burger. I guess its about time for me to go from Beacon, Lettuce & Tomatoes sandwich to this incredible eatable Turkey, Beacon & Avocado one which looks (and I bet it tasted) fantastic!!! !